You get out of the Box: A Fish-eye Lens, a 2 in 1 Macro and Wide-Angled Lens, one Universal Lens Clip and a Microfiber Carrying Pouch. The sole purpose of this Fotonica's Universal 3 in 1 Cell Phone Camera Lens Kit is to add another dimension to mobile photography while preserving the advantage of portability and universality in design. Small lenses in this kit fit perfectly into the adapter of the universal lens clip. The clip is then attached to the phone so that the external lens gets superimposed over the actual camera lens. 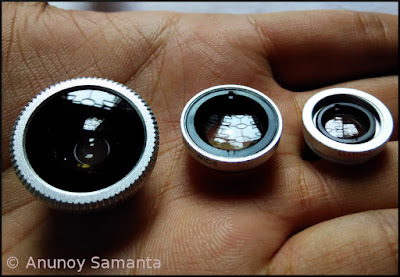 If the ergonomics of your mobile phone allows you, you can easily attach these lenses either to its primary or the secondary camera (for a fun selfie). If you have a jumbo smart phone with its primary camera placed away from the edges that'll be your first stumbling block with this lens kit. Your clip won't simply reach up to the required spot and you may have to hold the external lens with the other hand, killing the joy of mobile photography! Luckily with my Xiaomi Redmi 1S and Nokia X2, external fitting was not an issue. 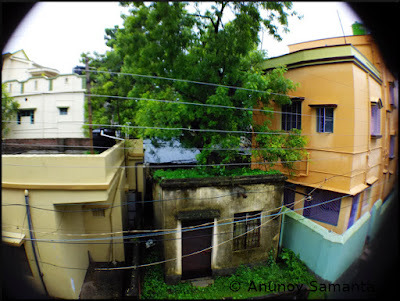 But, despite perfect alignment, photos through the fish-eye and wide-angle lenses had ugly thick dark round borders (much worse than vignetting) which couldn't be eliminated even after hundred adjustments. 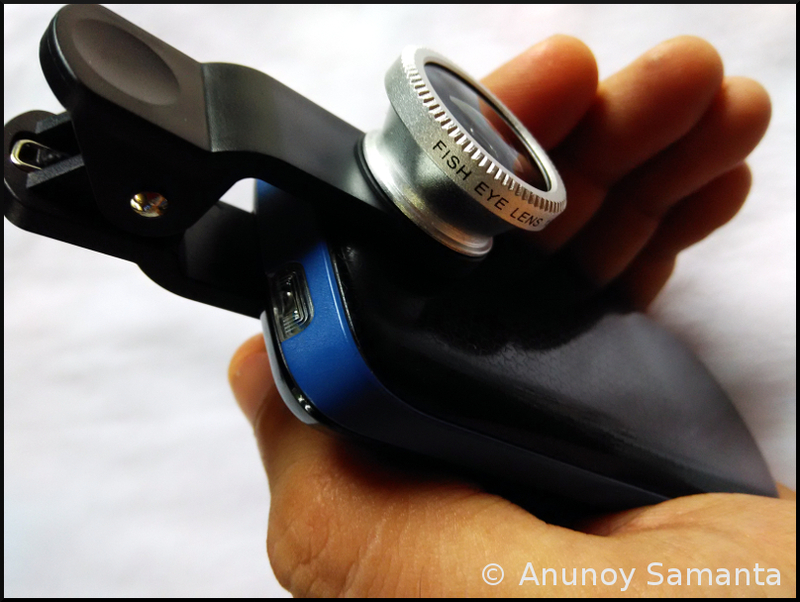 The build quality of the lens kit looked premium for its price tag with its beautiful aluminum mount for each lens and the sturdy plastic material of the clip that anchors perfectly to your device. But test shots using these lenses proved otherwise about the glass quality of the lens material! 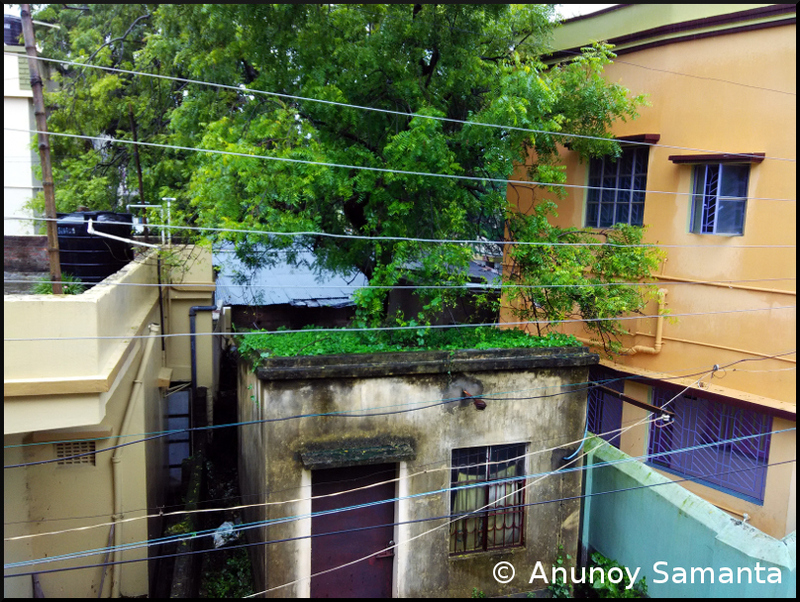 A normal shot from Redmi 1S without using any lens from the kit. The largest lens in this kit is the Fish-eye Lens which is supposed to capture widest view up to 180 degrees at the expense of rounded images. 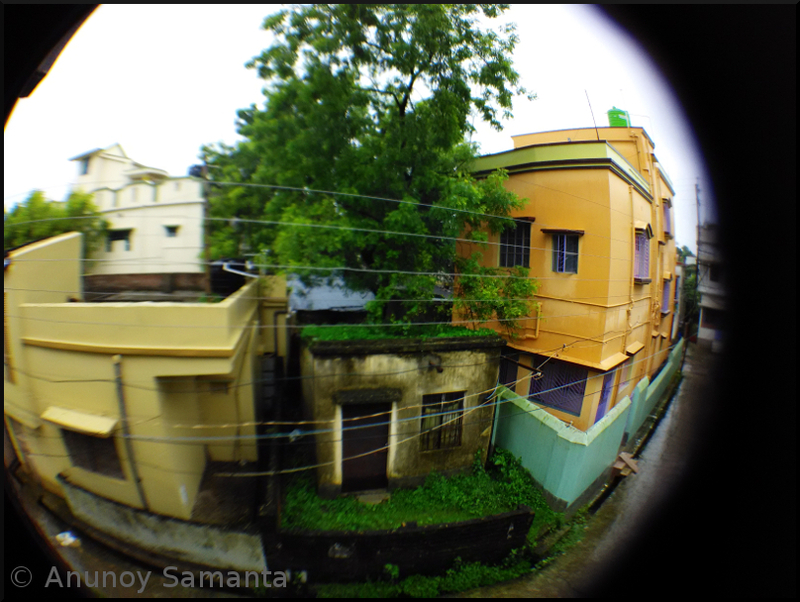 Nowadays a lot of camera apps incorporate a fish-eye filter too. This lens capture much more area than filters used in apps, by virtue of its optics. But majority of the portion in the image remains out of focus. Only the area you choose to focus (by tapping your phone screen) remains in focus and rest of the image is generously deprived of details! Sorry, I don't need a lens in my travel pouch that would fetch me unpredictable results. Test shot using the Fisheye Lens over the stock phone lens. Wide angle and Macro lenses in this lens kit are in a 2 in 1 set which need to be screwed together for the wide angle lens to function, while the macro lens can function independently on its own. Over the aluminum rim of the wide angle lens you can see the inscription 0.67X, i.e. - theoretically, this lens can increase the viewing angle by 49% letting you capture wider scenes and larger group shots. 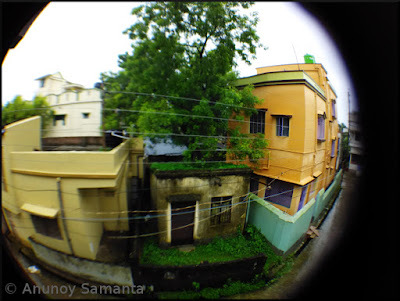 You might be disappointed to discover that there's no much difference between the photo captured with the wide angle lens and the fish-eye lens, except that it captures lesser area than the later. Under no circumstances this is a wide angle lens in actual sense as there is too much distortion, vignetting and lack of focus in the image! I would rather carry the fish-eye lens and leave this back at home. Test shot using the Wide angle Lens over the stock phone lens. 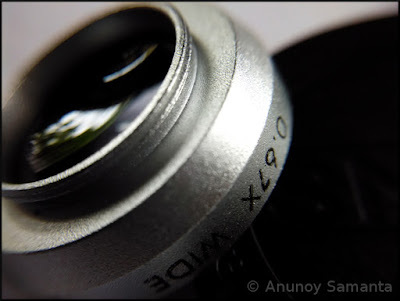 Unlike the former two lenses, Macro Lens in this kit is a pleasant surprise. According to Fotonica, this macro lens can capture super sharp images in focusing distance between 1.5 to 2.3 centimeters. In reality also it does so! After fitting the macro lens, the macro shooting ability of the phone camera got distinctly better. The inbuilt 'Macro' mode of the camera is no comparison for this macro lens. Although, focusing is bit difficult in such high magnification, but patience certainly pays and you can capture some amazing details. 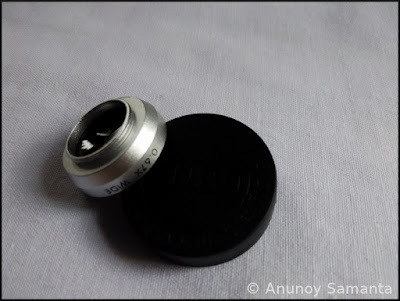 My one cent- gift yourself a bluetooth operated shutter remote if you're a dedicated mobile shooter intending to exploit this potent macro lens. Test shot using the inbuilt 'Macro' mode of the phone camera. Test shot using the Macro Lens over the stock phone lens. Final Words of Wisdom: The low price and the novelty in the concept of the Fotonica Lens Kit make it an appealing bait for mobile photographers but it fails to deliver any better image quality/opportunity than the stock phone lens except when the macro lens is mounted. 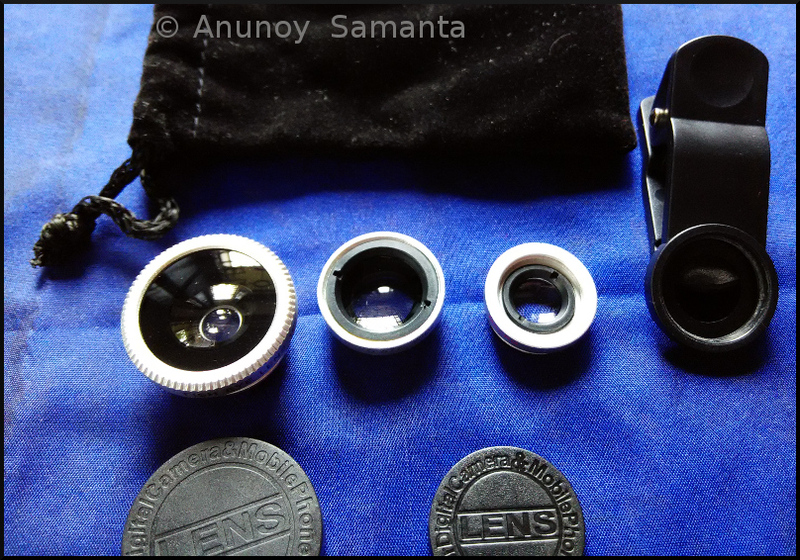 If you rely totally on your phone for photography then buying this lens kit for its able macro piece might be a good idea, otherwise chances are high that you'll remain unsatisfied. Personally I won't mind spending less than 10$ and keep myself light by throwing away the useless fish-eye and wide angle lenses from my kit. Happy clicking and keep clicking photos on the go! photo editing software & photo printing software that's renown for its ease of use. At last there's easy-to-use digital camera software for both home and business users. If you have a court order restraining another person from contacting you that would include them calling your cell phone. However the cellular service providers can make it nearly impossible to obtain copies of your cell free phonecalls logs before you have your court appearance. In some cases they can take up to 90 days after they have been served until the custodian of records will return a copy of your telephone billing records.